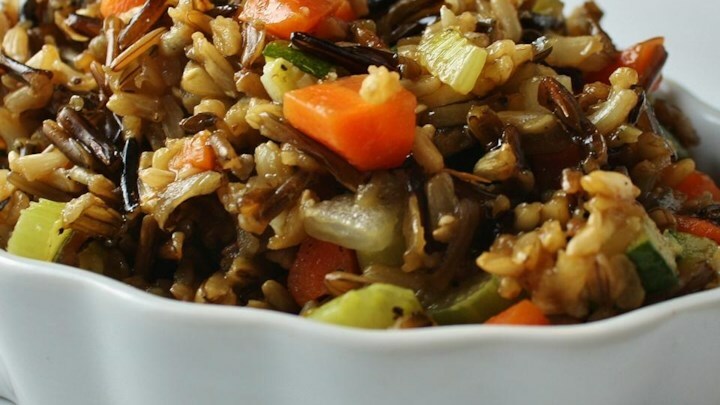 Step 1 In heavy saucepan, soak wild rice in boiling water for 30 minutes. Drain; rinse thoroughly. Step 2 In large skillet or Dutch oven, combine drained wild rice, brown rice, onion, carrots, celery, chicken broth, thyme, marjoram, salt, and black pepper. Bring to a boil over high heat. Step 3 Reduce heat to low and simmer, covered, until rice is tender and liquid is absorbed, 50 to 60 minutes. A perfect side dish for game birds. May be prepared ahead of time and microwaved just prior to serving. If you’re not serving the rice immediately, transfer it to a 3-quart microwaveable bowl and refrigerate, covered, until ready to serve. To reheat: microwave, still covered, at full power until heated through, about 10 minutes, stirring after every 4 minutes. To make this recipe gluten-free, be sure your chicken broth is gluten-free or substitute water. You may also use 1 cup white wine, 4 1/2 cups water.